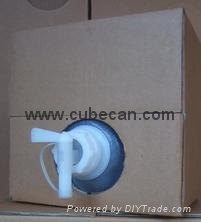 5 gallon laboratory reagent packing cubitainer used widely differently reagent,with 38 mm quick serve tap and 8 mm spigot for dispense very easy. 5 gallon cubitainer used laboratory reagent package for Silver nitrate,Hydrochloric acid solution,Buffer Solution,Acetate Buffer,Phosphate Buffered Saline,Sodium Fluoride,Sodium Carbonate,Sodium Thiosulfate,Starch Indicator,Sulfuric Acid,Potassium Iodate-Iodide,Hydrochloric Acid,Formaldehyde,Copper Sulfate,EDTA Titrant, Boric Acid,Acetic Acid,Ceric Sulfate,Acetate Buffer Solution,Alkalinity Titrant,Chloride Titrant,Deionized Water,ACS Grade(Type II equivalent,0.2μm filtered),Isopropanol (Isopropyl Alcohol),Phosphoric Acid.....etc. we also have reagent cubitainer 1L,2L,4L,5L,10L,15L,18L for customers.